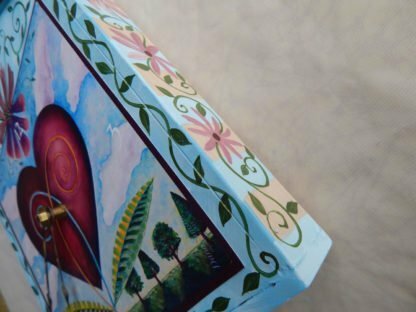 Functional handmade folk art. 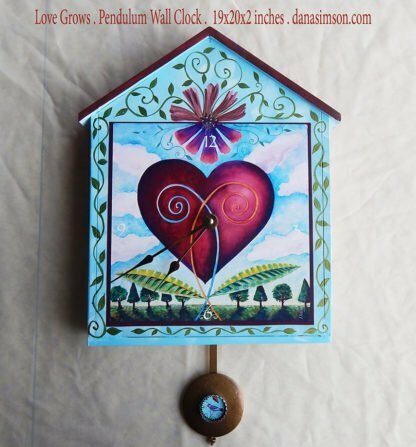 An archival print of my Love Grows painting is decoupaged upon the wooden clock. I add hand-painted details enhancing the main image- on the front and sides. 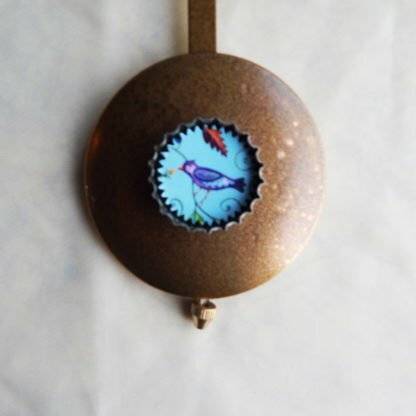 The pendulum has a detail image of a blue bird of happiness tucked into a bottlecap on it. (Or you can ask for a pop art daisy image. )The wooden clock is about 15 inches tall, 9.5 inches wide and two inches deep- the pendulum hangs down about 3 more inches and swings. Takes 2 AA batteries to run clock and pendulum. These clocks perk up a room and fit in any decor. The Love Grows Wall Clock recalls just how precious time together is. 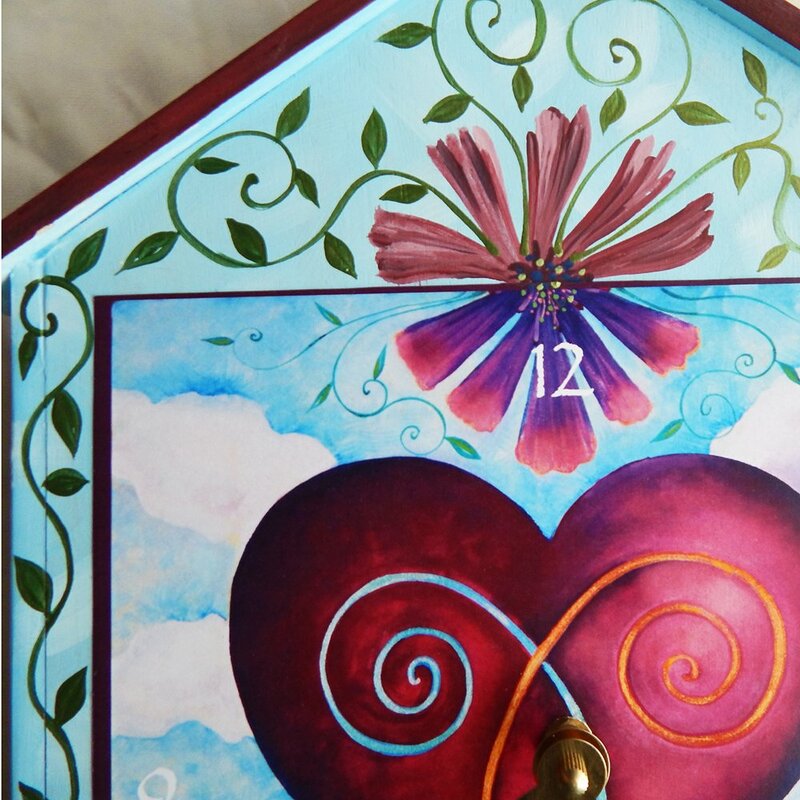 This clock makes a wonderful wedding or anniversary gift- I am happy to include names/date or a custom message on the back. Our Love Grows Wall Clock with a pendulum is handmade & painted in our Maryland, USA studio. This clock is 18 inches tall including the roof peak and pendulum, 9.5 inches wide and about 2 inches deep. The clock face is an archival print image clock face of my Long Love is a well tended garden painting. After years of living this I know it to be true, The most beautiful gardens are those that have become one with the garden site, lush and tangled at the base of elder trees within rings of established bulbs. 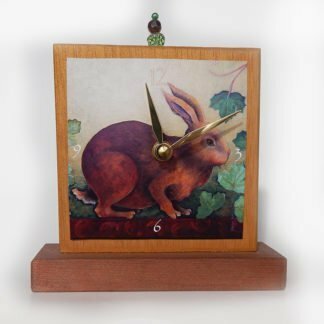 An archival print of my painting is decoupaged upon the wooden clock. 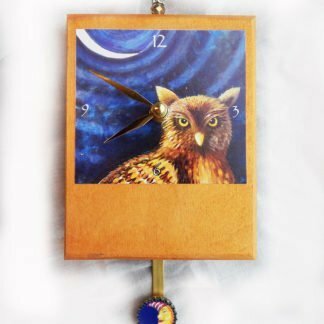 The clock pendulum has a small image of a blue bird of happiness or sunshine tucked into a bottle cap mounted on the metal pendulum. (or you may request either). It weighs about 4 lbs. The clock runs on 2 AA batteries one for the clock, the second runs the pendulum. My husband John cuts, sands and joins the wood pieces to form the house shaped clock body with a gable roof out in the wood working barn. Next, I drill a center hole and paint the clock body to compliment the image that will be adhered in the center. Once the image is adhered in place I hand brush in the details that will visually tie the clock face print to the background. I sign the unfinished back of each clock. 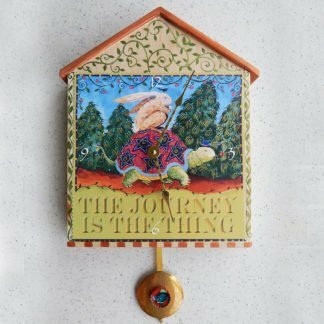 The design for these clocks is based in folk art traditions. 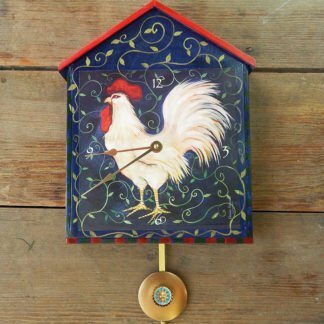 Our big clocks are a delightful addition to any decor. I have designed my big wall clocks to be coveted uplifting decor. Each carries a positive message. They make a treasured heirloom gift for people of all ages and interests. 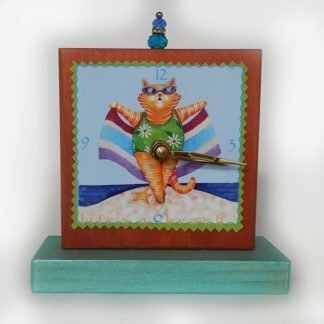 If you want the clock personalized, just send an email to us or give me a call. Any of my images are available as clocks in any size. 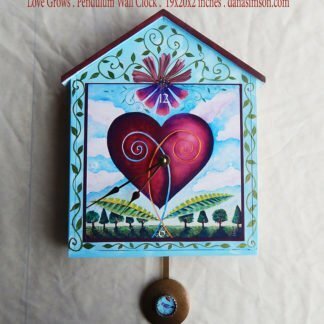 Our functional folk art handmade wooden Love Grows wall clock in a house shape with my garden heart image reminds you how precious time together is.